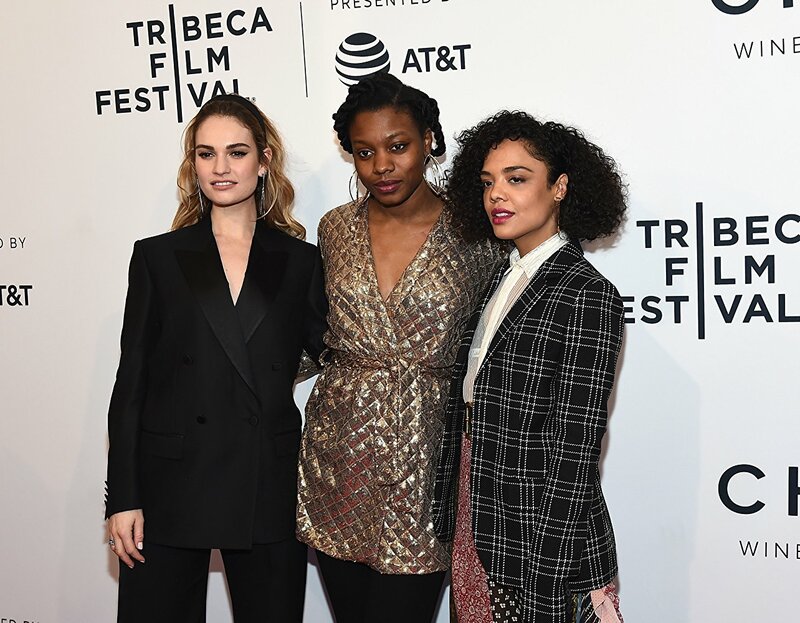 Thursday afternoon the Tribeca Film Festival announced the 2018 Juried Awards. Among the recipients was writer-director Nia DaCosta’s Little Woods. 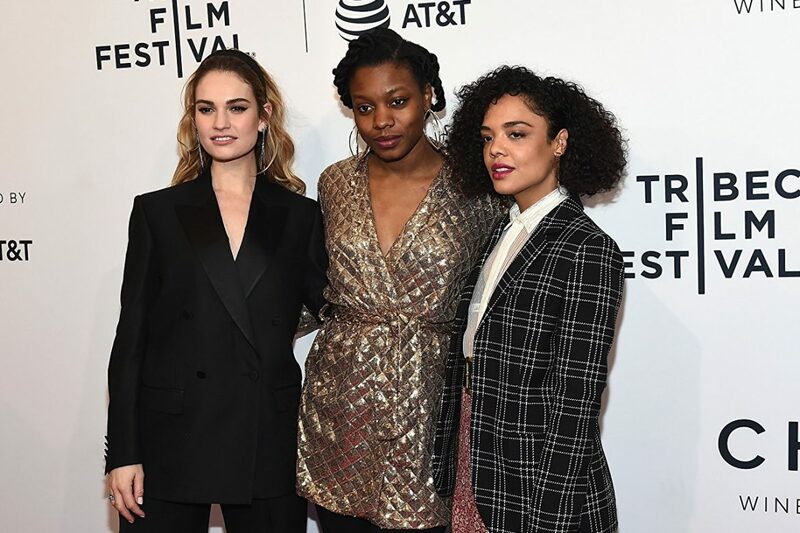 Starring Tessa Thompson and Lily James as sisters living in a North Dakota oil town which happens to be the further point on a map where a woman can obtain an abortion. Thompson plays Ollie is a food truck caterer who cared for their sick mother by running prescription drugs in and out of Canada (sometimes for the town kingpin played by Luke Kirby). James’s Deb is a waitress and single mom living in a cramped mobile home in a parking lot without her boyfriend (James Badge Dale) around for support. 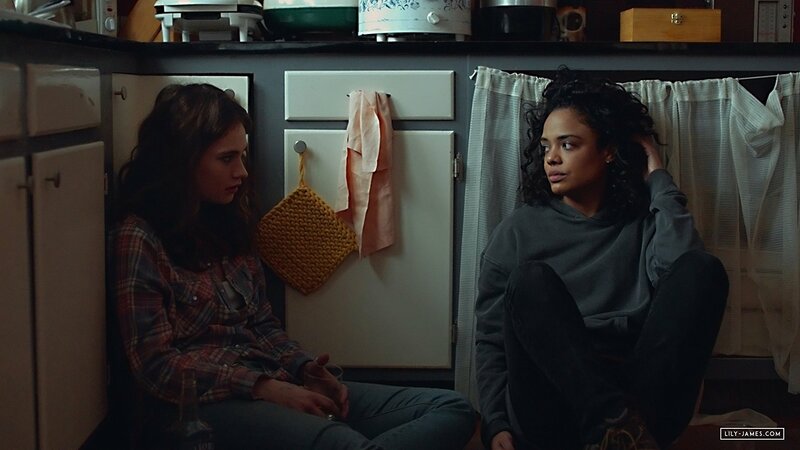 While Little Woods hits on some of the most important issues facing our country today (health care, rural poverty, abortion rights and access, the opioid crisis), DaCosta commitment to focusing on characters first turns an important movie a deeply personal and intimate film. Lesley Coffin: You set the film in the area in America where women have to go the farthest to have an abortion. Had you heard of this place before you started writing? Did this location inspire the narrative? Nia DaCosta: It’s hard because elements of the story came together in different ways. I knew I wanted to tell a story about women in rural America. I knew I wanted to address the recent legislation which is making it difficult for some of these women to have access to abortions. I knew I wanted to address the issues of health care in America. And while doing research I found this interactive map indicating where the closest place you can get an abortion in America is. So I found this space in North Dakota and once I knew the entire plot of the film, I felt it would be the most dramatic location to set the film. Lesley Coffin: Had you spent a lot of time in rural parts of the country before this film? Nia DaCosta: Not at all really. But before I started work on the film I was working as an associate producer in reality TV and traveled a lot to place I would have never traveled otherwise. I went to South Dakota for a TV show people will never see. I worked in West Virginia. And I went to summer camp in North Carolina. So that was how I saw a lot of the country and was struck by how different things were in those parts of America. We live in a much bigger and more diverse country than I think we realize. There was a moment when I realized, I didn’t grow up with a lot of money. But if I had grown up with the money my family had in those parts of the country, my life would have been much harder. I wouldn’t have had access to the things I have living in an urban part of the country. Things like Planned Parenthood are literally more accessible to people in cities because you just have to get on a train or a bus. That area of North Dakota has one hospital in a 50 mile radius, and it isn’t well funded and will always be crowded. Lesley Coffin: What were some of the aspects of life in that community that people might miss if they never go to that part of the country or if they do, just drive through it. Nia DaCosta: Well, I’m most concerned with my films being active and having women in my films who are active. I think when we’ve seen those communities depicted they are either shown comically or the films are tragedies and really focus on the characters wallowing in their hard lives. And I wanted a sense that these are people just living their lives and probably don’t focus on their hardships all the time. I didn’t want them to seem hopeless. And we visited a lot of residences and saw that over and over again. Lesley Coffin: Because of the film’s focus on realism, were you at all concerned with having well-known actors play the characters? Nia DaCosta: Tessa and I just kind of fell in love, and I think people haven’t yet seen how amazing she can be. But I knew she would be able to disappear into the role. Lily I’d seen on stage in London and I saw how powerful and actress she can be. But when we talked on the phone I think I almost tried to scare her off the project because we had so little money. I was literally warning her about the conditions we’d be filming in and she said, that sounds great. So she put me at easy when she said that and I was confident that she’d put the work into the role. But you never know if those casting decisions will be a distraction or not. But during our work-in-progress screenings a lot of people didn’t even realize it was Lily in the role. I wanted her to be unrecognizable in the role, which is part of the reason I suggested the character should have dark hair. Lesley Coffin: Luke Kirby hasn’t had a chance to play a character like this before, really rough and dirty. It was interesting that you originally had him read the role of the boyfriend. Nia DaCosta: At the directors lab I had him reading that part and he was terrific and they had this amazing chemistry. But he almost made the character too good, and she doesn’t have time to be in a fully committed relationship the way it was written in the original script. But it was important to me that this was a love story about the two sisters, this is about their relationship, so I had to remove that distraction. So he left the project early on. But we stayed friends and then I called him and said “there are two male roles you can play in the movie. Which one do you want?” And I remind him of that now and he has no memory of me asking him to pick. But he picked that role, which made me happy because he hasn’t played roles like that and I think he has a lot of range. And then James’s casting was interesting because I’d seen him in a lot of stuff but he’s always so different and I never seem to recognize him. So I wrote him a letter telling him how he’s the best part of every movie he’s in and how seamlessly he just fits into roles. Lesley Coffin: You mentioned in the Q&A that you have sisters, which is obvious watching the film. Did writing the script and making the movie give you a chance to kind of reflect on what makes that relationship so complicated? Nia DaCosta: I have a sister six years younger than me and we are so, so different. The one thing that’s similar about us is our work ethic, we both work very hard. But I knew what I wanted to do at a very young age and she’s still finding herself. So we focus our energy in very different ways. And being older I think there is a sense from her of feeling pressure to live up to me. And I want to help her but at the same time not step on her toes. And she was sitting two seats from me at the premiere and I was so nervous about what she’d think of the movie and how I presented their sister dynamic. Lesley Coffin: What were her reactions? Lesley Coffin: When did you choose to be a director? Nia DaCosta: When I was six I wanted to be a poet. I’d sit in my mom’s office, at her typewriter, coming up with rhythms. So I think I always wanted to be some kind of writer. And then I started to watch movies from the early 70s in my early teens. Movies like Dog Day Afternoon, Jaws, and The Godfather. And those films just left me in awe, realizing how much you could do. There was a period when I thought I wanted to be an actress, after seeing Annette Benning in American Beauty. But then I realized I really wanted make the movies that would have those performances in them. I think my mom actually told me I really wanted to be a writer-director and she’s right. Lesley Coffin: It’s interesting that you mentioned those movies from the 70s because the biggest criticism those films receive now is probably how poorly the women were represented. And you could see this film being made in the 70s, but it would probably be about brothers. What films were you pulling from? Nia DaCosta: In terms of the women in the film, Winter’s Bone and Frozen River were huge influences on me. In terms of the look of the film, I didn’t want it to look “like an indie.” So we looked at films which just inspired me visually, and we went as far as looking at films like The Searchers and High Noon to Dog Day Afternoon and The Conversation. Oddly, even Apocalypse Now. Films that maintain movement and utilize zooms in really interesting ways. Lesley Coffin: Even two years ago the opioid crisis wasn’t in the news the way it is now. Did you notice that it was on the rise when you were doing research? Nia DaCosta: When I went to North Dakota it just seemed to be all over, everyone either were on them or knew someone. They talked about people they knew who had been busted or that the hotel down the street is where they make meth. They could just point it out to me because it was such a big part of the community? Lesley Coffin: Were any of the characters Ollie’s selling to inspired by people you met? Nia DaCosta: No, they were inspired by people I heard about, rather than people I actually met. But I met so many men who were in so much pain, I could see how opioid addiction could easily happen to them. Just a few years ago doctors were telling people they weren’t addictive painkillers. And now there are entire communities changed by the presence of these drugs. Lesley Coffin: The spirit of film is about the relationship of these two, but when they go into public space they are often the only women around. Was that representative of the communities you went into? Nia DaCosta: There are two men for every one woman in that community. And with the exception of some truck drivers who aren’t in town very often, all the women work in service industries. They are waitresses or provide food to the construction sites or men who work in oil. There are some women who work on those male dominated sites but very few. So most of the women experience the opioid crisis either by servicing men who experience it first hand or being in a relationship with someone who’s addicted. Lesley Coffin: Did you develop the film before universal healthcare bill was passed? Nia DaCosta: I started working on it in 2014, a month before the official roll-out. And naively I thought, everyone’s going to get insurance. And so many people got insurance. But you go to this part of the country and so many people still don’t have it. There are still people left behind, because they literally don’t have room in their budget to pay $40 a month into healthcare. Or men on the oil rig were told they can take more money home without healthcare, and a lot of men felt with three or four kids at home, they need that extra money. Even though health care would extend to their children. Lesley Coffin: Looking at your resume, you’ve participated in so many of the programs for young filmmakers. Did you find the mentors you needed at those programs? Nia DaCosta: I did. The things they reminded me that budget is important, but never forget what your film is about. Finding that balance was something they really provided. I wanted to film in winter, but it was cheaper to film in summer. I wanted to film on location, but really we had a few days and then we had to find a location where crew could travel to. You are constantly making those choices and thinking how they’re impacting your film, the practicality and the romance of the business, and they prepared me to find that balance. Lesley Coffin: A lot of filmmakers, especially first time filmmakers talking about having a script people fall in love with and then realizing during editing that you need to chance the focus or cut something everyone feel in love with on the page. Were there moments like that for you on this film? Nia DaCosta: That mostly happened during the writing process for me, editing and revising the drafts. Like the character Luke read initially only to decide the focus needed to be on the sisters. But once we got to the edit, there were characters we had to cut and scenes that had to be cut. But for me, movies are about refining things down to the most important aspects. I’m someone who kills their darlings, I’ll throw them right off the cliff. And my editor is a director as well, and one of my best friends, and she started editing a week into filming so I could see a rough cut to watch during production. And I like her to have that autonomy as an editor before I get in the room with her I want to see how she’s put it together. Lesley Coffin: What’s next for you? Nia DaCosta: I’m writing three screenplays right now. One is a musical, one is a sci-fi space thriller, and one is an adaptation of an Ibsen play. They are all very different, but they are all about people faced with difficult options and they are all about women. The musical is based on a Jane Austin novel, set in the 20s. And they are all genre films, which I love. This film has elements of a thriller, but I’m really looking forward to making a genre film soon. Little Woods won the 2018 Nora Ephron Award at the Tribeca Film Festival. It will screen multiple times Sunday the 29th.